That's not photoshop. 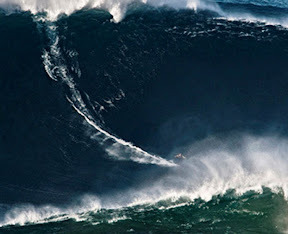 That is surfer Garrett McNamara riding the largest wave ever surfed. I personally have no idea what makes a person wake up in the morning and decide to attempt to ride a 7ft long piece of fiberglass and foam across the face of a 90ft wave but it is awesome. Also awesome, but on a more fittingly mundane level, is the opening of a new 2nd & Charles used bookstore here in Jacksonville. I find few things as exciting as books and having a massive new source of bargain priced reading material is akin to discovering an untapped oil field in your backyard. Okay maybe it isn't that great but a new bookshelf is much less intrusive than an oil pipeline. Speaking of bookshelves at my sisters request I'm looking at building a bookshelf for her new home based on some designs she found online and if all goes well I may be building some for myself as well as they are some of the most interesting and visually striking bookshelves I've ever seen. More on that when I actually have something to show.